Nekrium was the third starter deck for SolForge that I played and I was doing terribly with it against the computer AI at first after having an 80+% win rate with both Alloyin and Tempys. The deck, at first, seemed like some midrange green deck that just didn't do anything against the long-term inevitability of Alloyin or the all-in of Tempys. One of the biggest departures from a game like Magic/VS to SolForge is the understanding that not every card in a SolForge deck has to have utility in all circumstances. If there was a 2-game metagame, the optima SolForge deck would have 15 cards that were specifically chosen against one deck and only play those during the course of the match. The original problem I had with the Nekrium deck was that I originally was leveling up individual cards for the power they provided when I should have thought about leveling up combinations of cards instead. Realizing this changed how I played the match and my results dramatically. 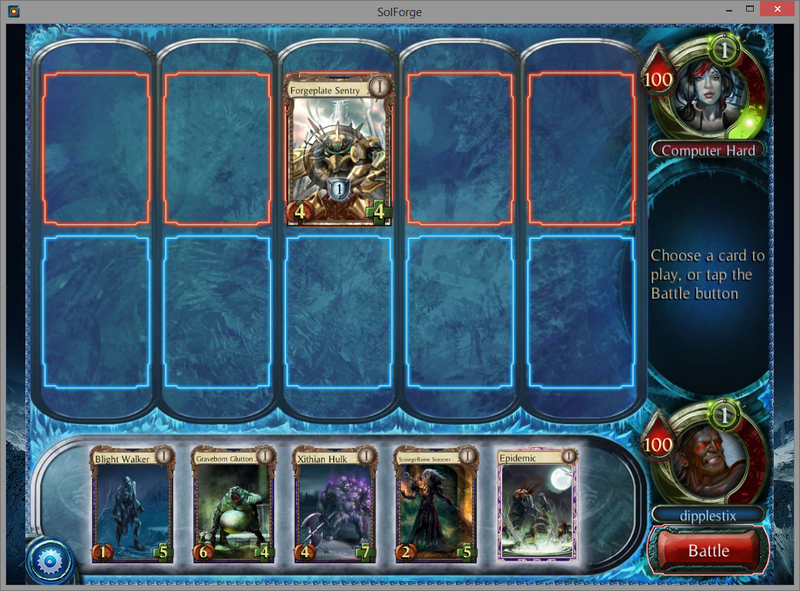 Grimgaunt Devourer: The best card in the deck. If you manage to play it early you can just force 1-for-1 trades for the rest fo the game and win pretty easily. It does not fall off late game so if you ever draw this, it's almost never incorrect to play it. 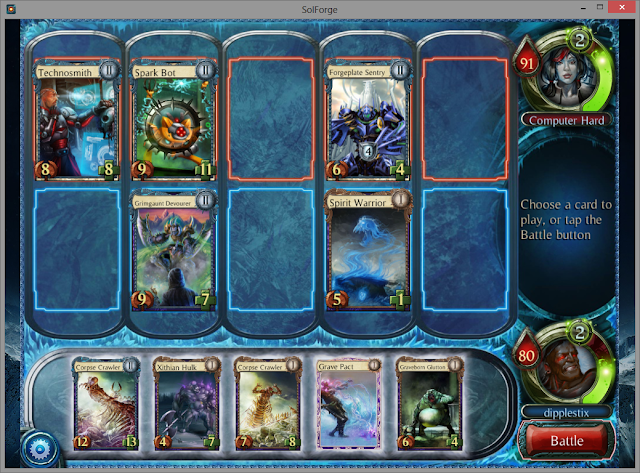 Epidemic: An extremely strong card in the Alloyin match. It negates all the armor present in the deck and along with Death Seeker and Vengeful Spirrit can provide massively one sided board states for you. 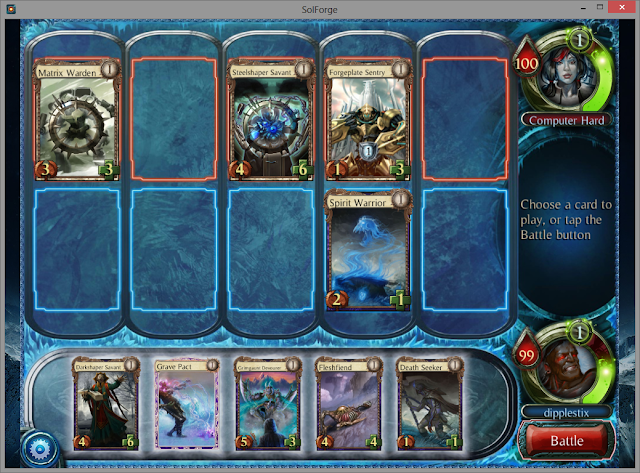 Levelling this up is a priority as the level 3 Epidemic is critical to trumping the lategame of the Alloyin deck. Grave Pact: This card is always solid, but almost never an all-star. Makes for good trades and can often be a 2-for-1 when used with Death Seeker and Vengeful Spirit. Just like Sorcerer, can be used to steal a game every once in a while with a Glutton. The higher levels of this card aren't that much better than the level 1 version, so it's generally not advisable to play it in order to level it. Graveborn Glutton: This was, at least for me, the most unintuitively good card in this match. Over the course of the game, the damage output from the death trigger is surprisingly high and definitely game changing. Darkshaper Savant: This card is pretty bad here, the effects at higher levels aren't impactful enough to be worth it. Fleshfiend: Outclassed at every level by Forgeplate Sentry and Ionic Warcharger, This card excels in other matches, but is just worse than Xithian Hulk here. Death Seeker/Vengeful Spirit: The core of the deck. These cards excel at dealing with the armor, mitigating damage from high power creatures, and enable the other cards in your deck. You almost always want to be leveling these up when you can. Vengeful spirit deals 7/14/21 which is extremely high and provides amazing utility. Hungering Strike: A card that has its niche usage at times and can occasionally generate interesting 2 for 1s. Xithian Hulk: A mediocre vanilla creature that can be played defensively when need be. 1) The best game plan is to land an early devourer and force them to deal with it by taking 1-for-1 trades over and over again. They have no hard removal for devourer so the only way they have to manage is playing creatures and trying to put enough damage on it. This allows you to stall the game as they attempt to answer it and a Devourer 3 is basically unstoppable. 2) Don't let important combat take place on their turn. 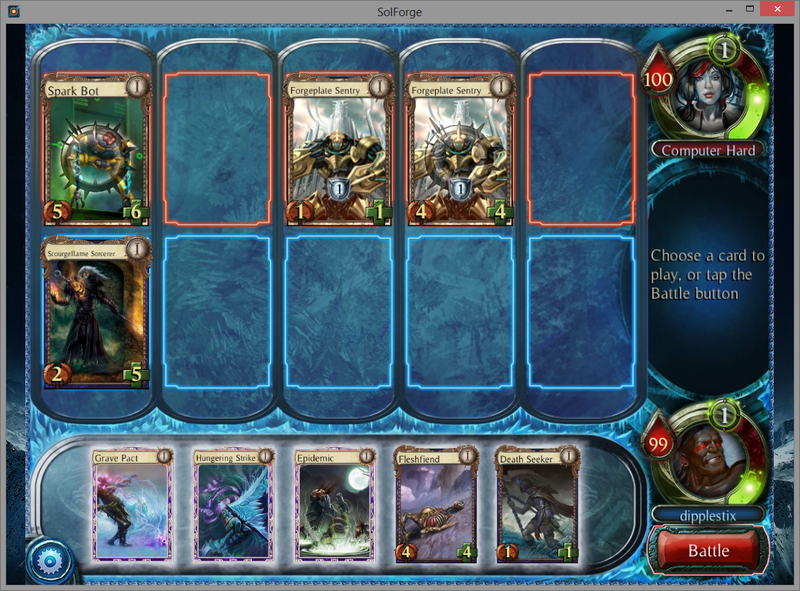 Between Pulse, Tech Upgrade, and Brightsteel Colossus they can blow you out on their combat steps so any big combats have to take place on your turn. It's better to set up defensive plays than offensive ones that have to happen during their combat. 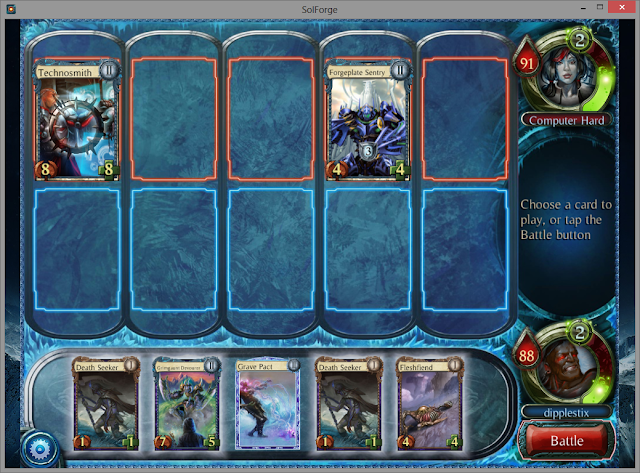 3) Try to keep as many robots off their board as possible. The deck synergizes well as their board grows, so try to trade a lot. The obvious play is Sorcerer in lane 1. 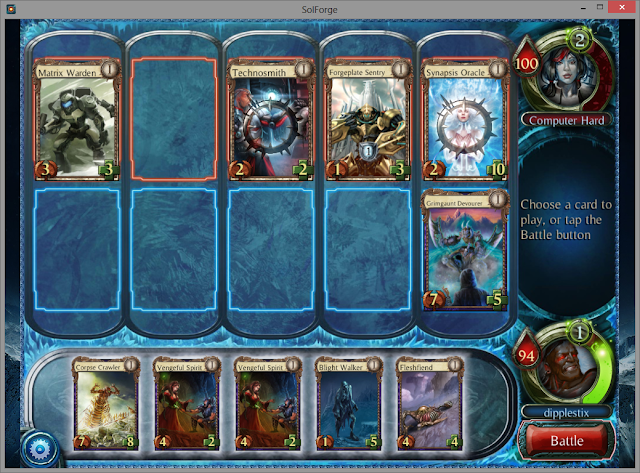 The choice for your second play is between Glutton in lane 3 or playing Epidemic (first, obviously). 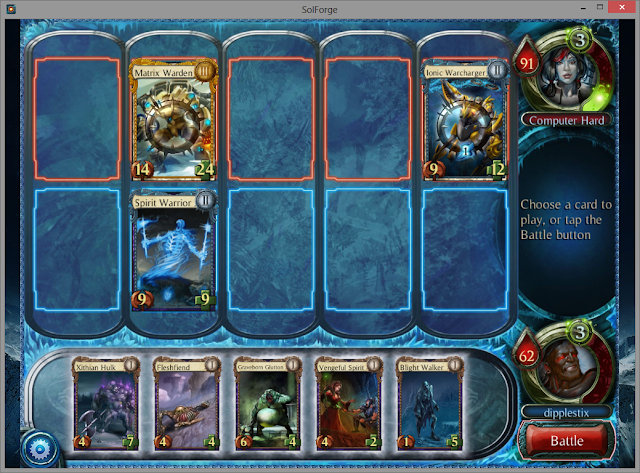 I choose to play Epidemic as there are only 2 in the deck (vs. 4 Glutton) and having it at higher levels is important. 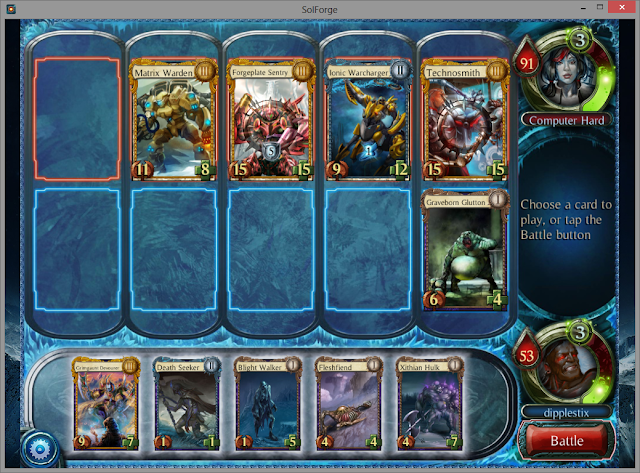 The choices here are between playing Death Seeker/Grave Pact vs. Death Seeker and Epidemic. Once again, because Epidemic is critcal to my late game plan I play Death Seeker in lane 4, use Sorcerer on Spark Bot, attack (misclicked in game and did not actualy attack, :() , then Epidemic. Devourer in lane 5 is obvious. The best second play is to Grave Pact the Savant in order to maximize the size of Devourer. Vengeful Spirit in lane 1, followed by Crawler, sacrificing Spirit (to kill Warden) in lane 4 is the best line here. 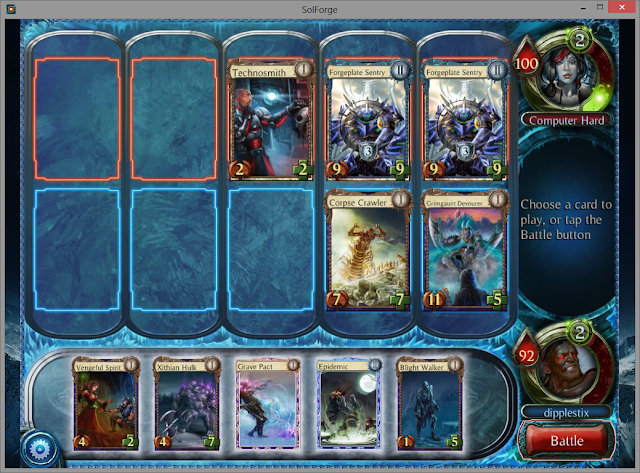 1) Play Vengeful Spirit in lane 3, Grave pact their Forge Sentry, then attack. This leaves us with a 13/4 Devourer and then with a 9/5 Forgeplate Sentry in lane 4. 2) Grave Pact sacrificing Crawler, then Epidemic. This leaves us with an 9/3 Devourer and them with a 4/4 Forgeplate Sentry. Option 2 is much better as every card in their deck (besides a level 1 Warden) can deal 4 or more, and the second option slows down their clock considerably. Devourer in lane 2, Death Seeker in lane 4. Not remotely close to do otherwise. 1) Level 1 Cralwer sacrificing Warroir into lane 3, level 2 Crawler sacrificing crawlwe into lane 1. This leaves us with a 15/4 Devourer and a 13/6 crawler and them with a 6/5 Sentry. 2) Grave Pact Sacrificng Warrior and Glutton into lane 1. This leaves us with a 13/8 Devourer and them with a 6/4 Sentry and 8/2 Technomancer. Option 1 makes Devourer more vulnerable, but they have to deal with it on their next turn and we have a much better board position so I chose to go with that. 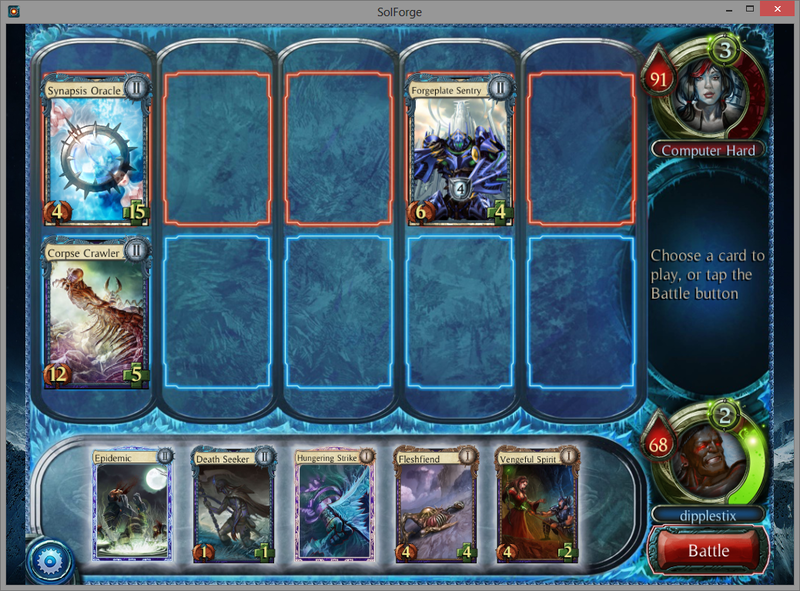 Option 2 gives a much higher chance of Devourer surviving, but costs us too much board position to do so. Attack, play Death Seeker anywhere, then Epidemic. Things are starting to look grim. Attack, place Spiriting into lane 2 and Glutton into lane 5 and pass. Good write up. Gave me some stuff to think about.